Watch all the action from Day Three, including Michael Phelps’ 200 butterfly final, at U.S. Winter Nationals in Federal Way, Washington. Maya DiRado of Stanford Swimming had a superb finish to edge California Aquatics’Caitlin Leverenz for the national title in the women’s 200 IM. DiRado led handily after the backstroke leg, but Leverenz made up some of the distance in the breaststroke. DiRado held onto her lead, though, and brought it home for a final time of 2:11:10 to Leverenz’ 2:11.79. Right behind DiRado and Leverenz throughout most of the race was Cal/SwimMAC’s Kathleen Baker, who wound up third in 2:12.13. 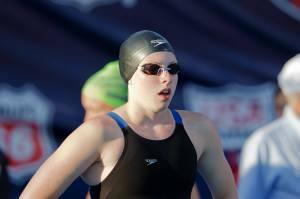 Stanford freshman Ella Eastin, who swims for SOCAL Aquatics, was the consolation winner with 2:13.79, just ahead of Elizabeth Beisel of Bluefish Swim Club (2:14.26) and Miranda Tucker of Indiana University (2:15.41).